Taylored Expressions makes beautiful dies. With each release, I am amazed at their continued creativity and of course their great quality. The Jingle all the Way cutting plate is smaller than their other cutting plates. The die cut image is beautifully bordered by the card base. Additionally the elegance of the script made me initially worried about how easy it would be to cut from paper, stiffened fabric or light foil. Let me share that I was pleasantly surprised as the image was easily cut from a variety of materials. 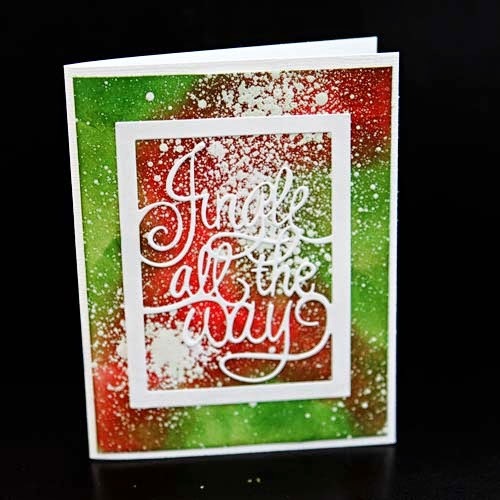 This card background was created with Tim Holtz Distress Inks. Once the inks dried, I sprayed some Tsukineko irRESISTIBLE spray on the background. The heat gun helped speed up the drying process. Then I added more distress inks to the background. As you can see, the irRESISTIBLE spray easily resisted the additional distress inks. Once the background was dried I adhered the Jingle all the Way die cut. This was a fast and easy card to create - plus its unique and gorgeous too! I'd love to hear your thoughts on the die and spray! Scrap Shotz has had a very busy fall with the Scrapbook Carnival at Spruce Meadows and the fall Scrap Shotz crop. The best news is that I will be back posting regularly on the blog - thank you for being a loyal reader. Over the next few posts, I would like to share some projects created for the Carnival and the crop using many of the wonderful mixed media products on the market. 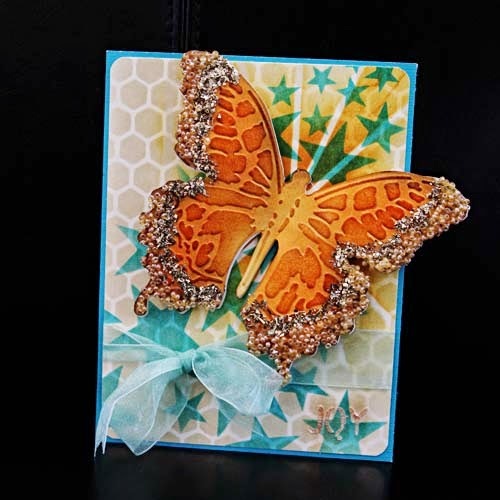 The card below showcases the very versatile and beautiful Sizzix Tim Holtz Layered Butterfly Die and Embossing Folder. From experience, I can tell you that the Sizzix die and embossing folder work like a dream. It easily cuts cardstock, chipboard and even starched fabric. Each of the die cut butterflies, were embossed without difficulty and with defined definition. The starched fabric required a few extra passes on my Big Shot but it still looked beautiful. This card was heavily inspired by the uber creative scrapper, Tammy Tutterow. From reading her blog and stalking her pinterest boards, I have learned so much about the various mixed media products and how to effectively use the diverse Tim Holtz products. I will be honest with you and tell that up until the beginning of October, I owned maybe 3 Tim Holtz products and had convinced myself I was unable to create these mixed media projects. Well, today I own almost every set of distress inks, lots of paints, a gaggle of stamps and several dies! Now a bit about this card...the background was created using distress inks through the layered honeycomb stencil. Then I applied another layer of distress inks through a stencil I made using the Taylored Expressions Ray of Sunshine cutting plate. Using the Joggles Shooting Stars stencil (it is sold out in the store), I added a contrasting layer of distress inks. For the butterfly, I sponged distress inks to the raised embossed areas and then heat set clear embossing powder to make the butterfly shine. The clear embossing powder really showcased the distress inks on the butterfly. Using a sturdy medium bristle paint brush, I applied gel medium around the outer edges of the butterfly. The glass beads were applied first. Then gel medium was applied just inside the beads so that the glass glitter could be adhered. A close-up of the butterfly wings can be seen below in the close-up photo. 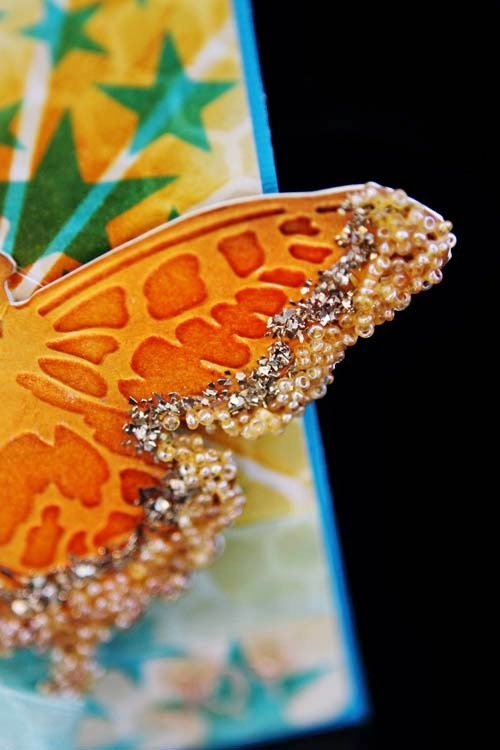 The die cut butterfly was adhered to the card front with pop dots under the wings so the wings appeared to be "fluttering". 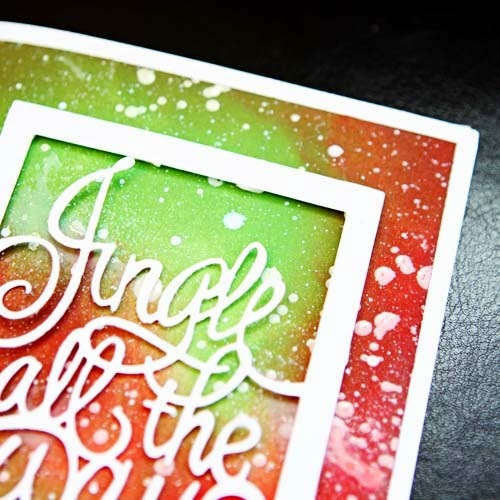 Lastly, I applied gold embossing paste through the Tim Holtz Christmas words stencil to make the card sentiment. I hope I have inspired you to try the various mixed media products available in the store. If you have any questions, please let me know. I will try to answer them the best I can - I have spent many hours educating myself on the various products as well as experimenting with them...and I love them all!! !